What should the society we want to build after the referendum look like? By Shadow Secretary of State for Scotland Margaret Curran. The day after Scotland goes to the polls to decide whether to go it alone or to remain a part of the United Kingdom, politicians of all parties will sit down, take stock and decide where to go next. Reflecting on how we want that day to look and the discussions we’d like to be having – regardless of the outcome – can help us establish the debate we should be having now and the questions we should be asking. For me, thinking about this illuminates two of the central questions we are grappling with in this debate now. Firstly, what choice should face the Scottish people and secondly, what should the society we want to build after the referendum look like? On the first question, until recently, I thought we knew the answer. Those of us in the Labour Party who fought for and have defended devolution since the very start of our political lives wanted a strong Scottish Parliament inside a modern United Kingdom. Those in the SNP wanted independence, and to separate Scotland from the rest of the UK. That was, after all, their founding purpose and the cause around which their members and supporters rallied. Now, only weeks into the referendum campaign, it looks like we’re dealing with something wholly different. Instead of a clear choice between in or out of the UK, the SNP are moving the goalposts. ‘Independence’ for them now means keeping the currency, keeping the Queen, keeping the flag, staying British, asking a foreign country to regulate our banks, set our interest rates. 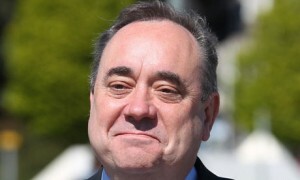 As if there wasn’t enough confusion already, we’re now told that Alex Salmond wants a third option on the ballot paper – “devo-max”, a brand without any details. The second issue we should reflect on – the kind of society we want to build in Scotland – should be the one we keep our minds focussed on as we progress through this campaign. We’re not having a debate about the future of our nation for the sake of it, we’re having a debate because at stake are two competing futures for Scotland’s existence. For me and my colleagues in the Labour Party, our belief in the United Kingdom isn’t borne out of nostalgia. I know that Scotland has always needed a strong voice in the UK. That’s why the Labour Party backed devolution and legislated for it days after coming into office in 1997. That’s why we introduced devolution. And that’s why we have carried on developing devolution and passed more powers and responsibility to the Scottish parliament, to get the balance right across the UK as a whole. We have always had a vision for a strong, prosperous Scotland sitting inside a United Kingdom where we pool sovereignty with three other nations to protect our shared interests. It is a state of affairs that has become more, not less, relevant in an interconnected and interdependent world. For the SNP however, the kind of society they want to build is unclear. As my recent Parliamentary Questions revealed, SNP ministers in Edinburgh haven’t had a single conversation with their counterparts in London about the consequences of independence. On issues as important to people as the economy, their jobs, their benefits or the nation’s security, not a single letter or email has passed between Scottish and UK ministers. For a party that has waited generations to be in a position to deliver on its founding principle, the only conclusion I can draw from this is that the SNP no longer believe they can convince the Scottish people of independence. They have simply given up. The first minister says it’s the only thing he’s campaigning for, but from his desperation for a third option, however woolly, to his lack of interest in opening up a discussion with the UK government on what happens the day after independence, I can only conclude he’s bottled it. Surely it’s possible to construct an argument for the union without fabrication, obfuscation and outright lies? You have to have a basic grasp of the facts on how the UK is constituted. If you did, you wouldn’t make such ignorant and embarrassingly stupid comments. What on earth do they teach you down south? It’s a union, geddit? Look it up. What happened to you? Explosive bile? It isn’t hence why it is the only tactic the anti-independence brigade have. You’ve not made coherent sense in any of your replies to my post. More pertinently – why bother? You’ve completely ignored what I typed, rather. Happened? I’ve been mocking you. I see, so you do the same job I do? No, wait, you’re just a poor troll.